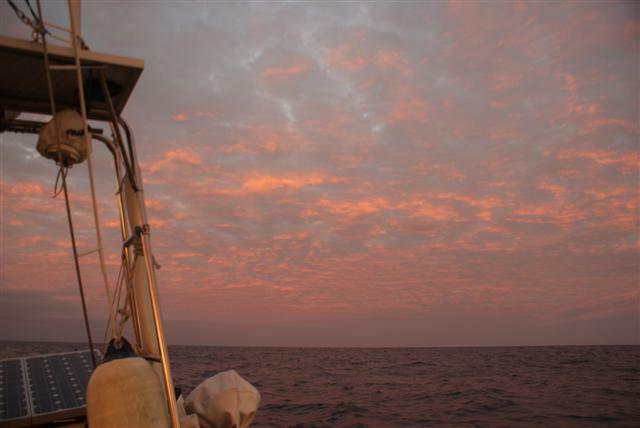 Red sky in the morning is a shepard’s warning…..
Our second day at sea was frustrating because we couldn’t get enough wind to sail and spent almost 24 hours motoring. After finishing the NICA net I plotted the positions of the other boats on the chart plotter and found we were all still quite close together and the others were also motoring. We had been warned we would have a day of motoring by Bob McDavitt, our weather router. The highlight of the day was that we caught a fish, this is a fairly rare occurrence on Camomile so we were really excited as Bill reeled it in. It was a small mackerel tuna, we even managed to catch a second but unfortunately it jumped off the hook as soon as we got it near enough to the boat to gaff it. During my evening watch the sea became so glassy I could see the reflection of the moon in it. At around 23.00 the wind piped up and I got Bill up so we could put the sails back up and start sailing again. We sailed over night but by the morning the wind was dropping again. We sailed slowly until midday when, with our boat speed down to 3kts, we put the engine on again. There are a couple of boats ahead that left the day before us but they haven’t got any wind either so we’ll just have to be patient. It was a frustrating day with only 105 miles covered in 24 hours but someone somewhere wished for more wind …..
Posted on May 1, 2012, in Uncategorized. Bookmark the permalink. Leave a comment.